Graffiti legend Stash continues his long relationship with Reebok with his signature touch over the classic Reebok Question. 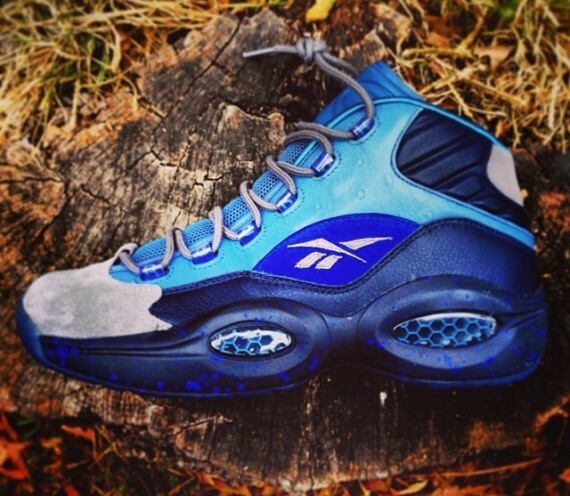 Stash hit the Reebok question with his signature combination of blue hues and materials, taking over a leather, suede and ostrich skin build. The predominantly blue look for the Question by Stash is topped with a grey toe and grey laces, along with a subtle blue paint speckle over the midsole below. Enjoy a first look below, and be sure to stick with Sole Collector for further details.